Ever wanted to know the size of the biggest shark?Ever thought where in the world the tallest rollercoaster is? 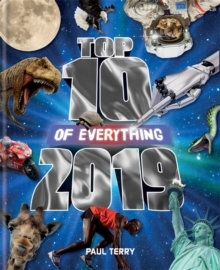 Or wondered astronaut has spent the most time in space?If so, this is the book for you!Top 10 of Everything 2019 is divided into genres including Animal Kingdom, Sport, Forces of Nature, Video Games and Mechanical Creations, and includes lists, charts and tables to break down the details of each amazing fact. Packed full of photographs, charts, graphs and incredible information, this is the perfect book for anyone with a curious mind and an insatiable appetite for facts, stats and trivia. Loved by kids and adults alike, it's the perfect stocking filler for this Christmas!